Masterful listening is one of the fastest ways to build intimacy in any relationship. It’s also an essential (albeit unexpected) driver of influence. To help the cause, there’s another new eBook on the street—a hand-picked collection of simple and underused listening best practices. Great listening is far easier said than done. Without deliberate focus, your listening is likely mediocre at best. Plus, the kind of listening that really makes a difference requires listening for more than data; it means appreciating and acting on the psychological value of the act of listening itself. 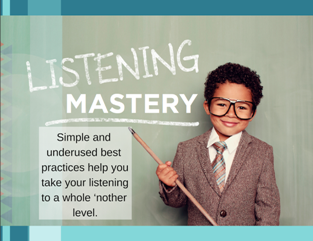 Happily, masterful listening can become natural and instinctive over time. In the words of Chinese philosopher Lao Tzu, a journey of 1000 miles starts with a single step. Hence this new eBook with 13 thought pieces excerpted from our Weekly Tips series. The kind of listening that engenders deep trust and promotes real relationships is a kind of listening that requires that we pay very close attention. That’s where most of us fall down, because we all deal with ongoing, everyday interference. Consider four barriers to paying attention: A habit of talking (we’re pretty much all guilty), everyday distractions (your phone probably buzzed while you’ve been reading this Tip), the little internal voice (the one that just said, “What little internal voice?”) and a fear of intimacy (most of us have at least a little of this, too). The question isn’t whether you deal with these attention-derailers; the questions are when and how. Tune in. You cannot multitask undiscovered—not for long. Eschew the distractions: close the door, face away from the computer, put the smart phone out of reach, decline to Instant Message with others. Acknowledge early and often. Paraphrase the information people give you and empathize with their emotions—even the ones you sense but don’t overtly hear. Do this ten times more than you think you should. Get a little Zen. When the little voice in your head pipes up, notice and observe it. Raise your consciousness about it in the moment. Then gently yet swiftly return your focus to the real conversation at hand. This is similar to the practice that experienced meditators use of refocusing on the breath. A simple practice that is vastly underused is doing a quick recap of your prior communication at the beginning of your next one. It takes some effort (though not a lot) and usually has really big payback. It’s especially potent after your very first interaction with someone. For those who so far think, “Yeah, I’ve got this,” congrats. Only … are you sure? There’s more in the eBook to stretch your thinking and skill, like an empathy mastery quiz, a four-minute listening challenge, and a two-part test that is critical to pass before you stop listening and start problem-solving. There are also thirteen “Make it Real” calls to action that are guaranteed to take your listening to a whole ‘nother level—single steps towards a different kind of working world.